Fabio Di Giannantonio has taken victory in the first ever Thai Grand Prix, holding off Lorenzo Dalla Porta in an action-filled race that saw Jorge Martin edge closer to the title win after a last corner battle saw Marco Bezzecchi end his race in the gravel. 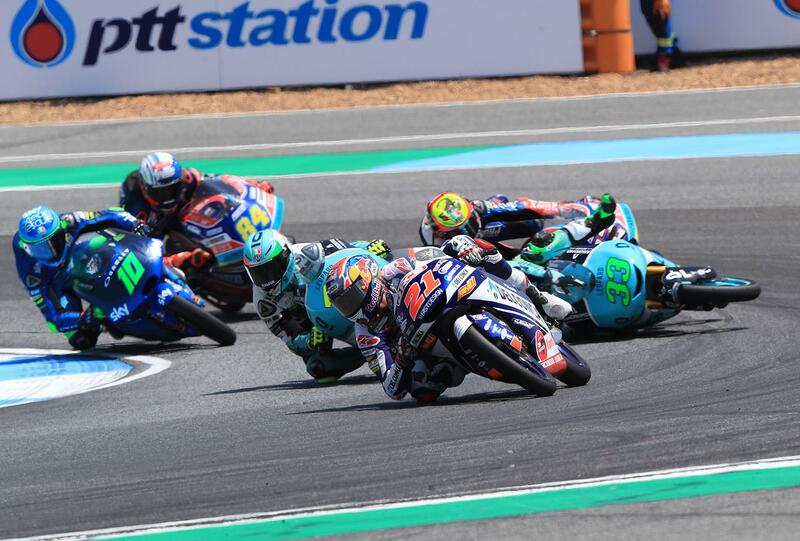 Riding injured, Martin was able to pick his way through to sith until an ill-fated move from Enea Bastianini took him and Bezzecchi out of the race. Brit John McPhee crashed on the last lap, after suffering through the race with injuries sustained in a Friday practice crash. The breath-taking action started from the word go as Bezzecchi got the perfect launch from pole to lead into the first corner, with Kazuki Masaki and Jaume Masia slotting in behind the Italian as the freight train thundered down into Turn 3. But despite his best efforts, Bezzecchi wasn’t able to make the break as the top 18 locked horns for a classic lightweight class battle. Di Giannantonio soon made his way to the front after being forced wide by the aggressive starting Darryn Binder, the South African looking strong before getting caught up in a tangle with Albert Arenas with both riders going down on lap four. The battle raged on back on track as the race lead swapped and changed countless times, lap after lap, with Martin sitting patiently just inside the points with ten laps gone. In typical Moto3 style, with just six laps to go in Thailand, 1.8 seconds covered the top 18. Heading into the final lap though, it was Bezzecchi who had the advantage and he managed to use the KTM grunt to hold it into turn three, but then Di Giannantonio and Dalla Porta slipped by on the run back up to turn four. That pushed the Italian into the grasp of Bastianini, Jakub Kornfeil and Martin. That meant Dennis Foggia was able to stay out of trouble to claim a maiden Grand Prix podium in third, with the Italian staging an incredible comeback from 25th on the grid. Martin, putting in another stunner of a performance, crossed the line in fourth to capitalise and extend his lead in the championship to 26 points. Just behind the Spaniard, Gabriel Rodrigo was another on a charge and in the hunt throughout, eventually taking home fifth, with rookie Vicente Perez picking up his best result of the season in sixth and yet another rider to put in a sensational performance. 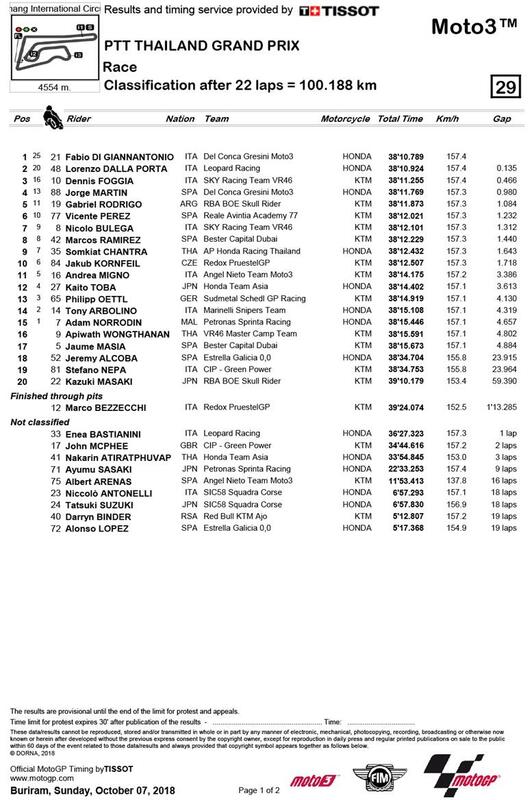 Nicolo Bulega claimed his first top ten of the season in seventh, with Marcos Ramirez eighth. Wildcard Somkiat Chantra, meanwhile, was one of the riders of the day as he took ninth – a magnificent ride from the Thai rider in his home race and first appearance. Kornfeil, who ran wide at the final corner to avoid Bezzecchi and Bastianini, crossed the line tenth. There was heartbreak for Ayumu Sasaki as the Japanese rider put on a great Sunday show after top pace throughout the weekend and then crashed out courtesy of some slightly too-close racing.